Brook trout hold a place of reverence among many anglers for their colour, fighting ability, and taste. For some anglers like my dad they have attained a place of reverence among the freshwater species of our province. As a lad, I can recall growing up listening to him tell stories about fishing for these colourful creatures in the local streams around the outskirts of Bancroft. By his account they were plentiful, sensitive, yet easy to catch (if you knew how), and a source of a great number of fond memories. Personally, I can recall some of our camping trips to Algonquin park where my dad would pull our station wagon over and disappear down the side of the embankment, only to return with a few of these little creatures. Pan-fried brook trout over a campstove was my first real taste of wild food, and very likely one of the sparks that ignited my passion for fishing for these delicious fish. Times change, populations grow, and land gets developed. In turn our, impact to the environment (at least locally in Ontario) sent the population of brook trout into somewhat of a nose dive in many areas. In the back of my mind I knew that development and things like agricultural run off can effect the water quality of small streams. But this effect really didn’t hit me hard until my dad reported back after a return visit to some of those streams a few years ago. I’m told he only caught a single trout for the whole trip. Sadly I felt like the days of bountiful brook trout were lost. My best days fishing brook trout have been in the middle of Algonquin park, and in Gaspésie, Quebec. Fish were plentiful on both trips, however, in each case I had to work extremely hard, and sometimes travel for days, to find the places of historic abundance. Anytime I tried to catch them locally, I always ended up with an empty basket. After these local trips, my view of brook trout fishing was fairly pessimistic. My conclusion: good easy local brook trout fishing just didn’t exist any more in southern Ontario. Day 1 arrived on January 18th, and we met at our rental cottage and prepared the snow mobiles and gear for a days run into the woods. Although we got off to a late morning start we were still hopefull. Afterall, there were five of us, two snowmobiles, an array of fishing rods and tackle. We could cover a lot of ground with that set up. We started the trip on the lake where I had some success the previous fall and spread out along the shoreline. There was at least 12″ of ice wherever we drilled with a max of 14″ in some places. Simple live bait rigs with gads were the ticket and within the first 30 minutes, I had 3 fish on the ice. Another two were iced among the remaining members of our group and the fish kept biting. We ended the day with a respectable 10 fish iced, about the same lost at the hole, and countless more missed hits. Tired yet happy, we returned to our cottage for a celebratory beverage. We beat the sun up on the second day and started our trek back into some of the more remote lakes. The ride in was several kilometers and things got pretty hairy with three dudes on the back of a snowmobile. Half way in the three man machine was working a bit hard so we moved one of the guys to a towed sled. We resumed our trek and made it to the lakes. Thankfully I was the navigator on this trip which secured me a permanent position on one of the cushioned seats. One of the gents with his first brook trout ever through the ice. Fishing was tough on the second day, and we worked real hard moving around the lake to try and locate fish. Our efforts paid off and we racked up another 6 fish on the day, with the majority of them being bigger than the previous day. Shallow wood seemed to work well for us as well as rock points. Just like that, another satisfying, albeit hard, day was behind us. Having satisfied ourselves on brookies over the first two days, we decided to switch things up on the third day and target a different lake that was stocked with splake. For those who don’t know, these fish are hybrids between a lake trout and a brook trout. This presents some added complexity to fishing for them as they have been known to behave like both species whenever the mood strikes them. With this knowledge in our minds, we varied our presentations with a mix of setlines and a couple jigging presentations in deeper water. As luck would have it, the splake were feeling brookish on the third day and while exploring the area with a depth finder, I looked back to see that my Gad had disappeared. Not sure what to expect, I began pulling up my line and eventually pulled my gad right out of the hole. Seconds later I felt a familiar tug and I set the hook on a beautiful 5lb splake. I eased the tank up from bottom and attempted to remove the line from the gad so I could use my rod. Murphy’s law kicked in and the line snapped….. I was left with a gad in one hand and the business end of the line in the other. With no more time to be gentle, I hauled the fish up and buried my arm shoulder deep in the hole so I could grab ahold of the fluorocarbon leader. The fish crested the hole and I finally took a breath. Aside from the interesting fight, I also noted the deep gold colour of the belly of this fish. Most of the splake I have caught in the past were distinctly silvery, however this one seemed to lean towards its brook trout genes. I’m guessing the lake may have something to do with the colour. This splake happened to be my largest of the species to date. We visited one more small lake and added a few more brookies to our tally. All said and done, we caught about 22 brookies and one big splake between the 5 of us over the course of 2 and a half days. Its not the big numbers I used to hear my dad talk about, but its definitely respectable for the size of the lakes we were on and for the species. Catching that splake was the cherry on top of an already amazing. Stocked lakes. They are out there and are stocked for a reason, so go fish them! There are so many reasons to target these lakes like: the more you target stocked lakes, the less your focussing on natural strains of fish, which preserves the genetic diversity of our province. Also, part of your license fees go to stocking these lakes so why not reap some of the rewards from a program you help fund. The primary focus of this blog has always been showcasing the natural beauty of Ontario and its wilderness. However, at times I have been known to write up posts on my travels to other provinces of Canada. This article happens to be one such post which describes my recent trip to Alberta. I love Ontario and don’t think I would be as happy living any where else. But if I had to choose a close second, the Albertan Mountains would definitely make the short list. Our trip began on the last days of June, 2016, with a flight out of Ottawa. We landed in Edmonton, spent a few days with my cousin and attended a wedding of a college friend. Edmonton was interesting in its own right, however, aside from the river valleys, the area is quite flat. Not to mention the only wildlife to be seen in the area where we were staying was the multitude of magpies which plagued the neighbourhood trash bags. After a few days we were itching to head west and find some elevation. The approach to the mountains was gradual. They started as shadows on the horizon shrouded in the mists of distance, and slowly became clearer. The mountains were large, silent giants. Some appeared sloped and weather beaten while others maintained their aggressive peak and shear faces. The Rocky Mountains are some of the youngest mountains in the world, and when compared to old ranges like the alps, the difference is obvious. The mountains were above all impressive, and each seemed dwarf the highest peak in Ontario (the Ishpatina Ridge, located in Temagami, some 693 metres). These mountains are even more impressive up close, and during our drive down the Icefields Parkway, we often felt like we were at the feet of these giant monuments. At times it can actually be difficult to drive and sight see at the same time as the mountains are so sheer in places. Although the mountains were impressive, the rivers were also majestic. Each river we passed seemed to be swollen with water from the mountains, charged by the hydraulic head. The colours ranged from milky white to deep emerald green. Made white from the deposition of silts and minerals from the nearby moutnains and glaciers which turned a deep emerald green once the minerals oxidized. The latent trout fisherman in me was screaming insults at me and chided me for not bringing a line and lure. These rivers often fed into large powerful cascades such as the Sunwapta and Athabasca Falls. The park has countless hiking trails, bike trails, picnic areas and lookouts. Scenic views are in no shortage in the park, especially along the Icefields Parkway. There are even glaciers that you can walk up to and walk on if you have the cash and are so inclined. Sadly, global warming is very obvious here as signs indicating the previous extents of the glaciers are placed periodically along the hike to the foot of the glacier. The scenery was breath taking, but so was the plethora of animals which inhabit this majestic landscape. Some of the more recognizable species include mammals like elk, white tail and mule deer, moose, caribou, mountain goat, dahl sheep, black and grizzly bears, as well as wolfs and a wide variety of other species. We were lucky enough to see several on our trip including elk, black bear, white tail and mule deer in full velvet and several cheeky ground squirrels. We were even lucky enough to have a cow elk and her calf visit our cabin in Jasper! They stopped, grazed a bit, and then just moseyed in towards the middle of town. Although amazing to us, I’m told occurrences like this are old hat to residents. Much of the wild life we encountered was along the Ice fields parkway. This stretch of highway between Jasper and Banff is renown across the world as place where wildlife can be seen with ease. As easy as it is to encounter wildlife it is important to remember they are just that. wild. So feeding them or trying to interact can be both dangerous for you and the animals. The sheer size of the mountains did a good job of making me feel insignificant in the presence of their vastness. Luckily the unique opportunity to see such a variety of animals up close reminded me of how diverse the landscape is and how much these species depend on habitat protection and conservation efforts from humans for their continual survival. So although we may be insignificant next to a mountain, we make a mountain of a difference to an elk or bear when we protect areas like jasper and Banff. Coming from Ontario, a place where elk are rare and only present due to restocking efforts, I can appreciate what these parks represent. So I urge you to take a drive through the Rockies and experience the significance of a place like this. Admire the animals and diversity from a distance. See this natural wonder for yourself. I’d be wiling to bet that seeing these wonders will give you an appreciation for the natural resources we as Canadians can take for granted. Special Thanks to http://icefieldsparkway.com/maps for providing details on where to slop and sight see. Based on the number i’ve seen this year, Id guess we are in a boom year for rabbits. The particular bunny below was quite hefty, likely due to an easy winter and an abundance of food. Its great to see healthy populations of game animals. Especially in an urban setting like my backyard. I just hope he stays away from my vegetable garden. Ask any farmer or landowner from the southern United States and they will tell you feral pigs, otherwise know as the Eurasian Wild Pig are one of the biggest nuisances they face. With populations at unprecedented levels and their presence being felt in 39 states (or more), these beasts terrorize farmers and landowners by destroying crops and rooting up land. Simple put they are the definition of invasive. So why discuss them on a blog centred around Southern Ontario? It seems we too may soon have to deal with these invasive pests according to recent memorandum released by the Ministry of Natural Resources. Apparently feral pigs have been spotted in the united counties of Prescott and Russell which are located east of Ottawa between Ottawa and Hawkesbury. According to the memorandum, the MNR have authorized farmers and hunters to kill feral pigs under the authority of a small game licence (See a copy of the memorandum below). All pertinent hunting rules and regulations regarding safety still remain in effect while hunting these animals and all kills or sighting should be reported to the ministry of natural resources at 1-800-667-1940. 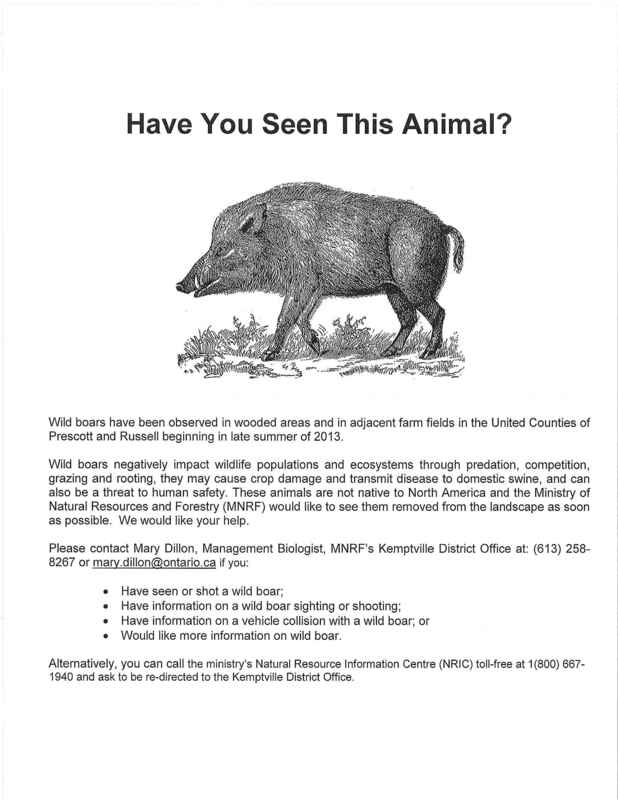 Those interested in more information on Wild boars in Ontario are also encouraged to contact the MNR. In addition, “Wildboars in Canada” is a website dedicated to tracking sightings and encounters across the province. Invasive species can be a problem for any ecosystem and those found in Ontario are no exception. 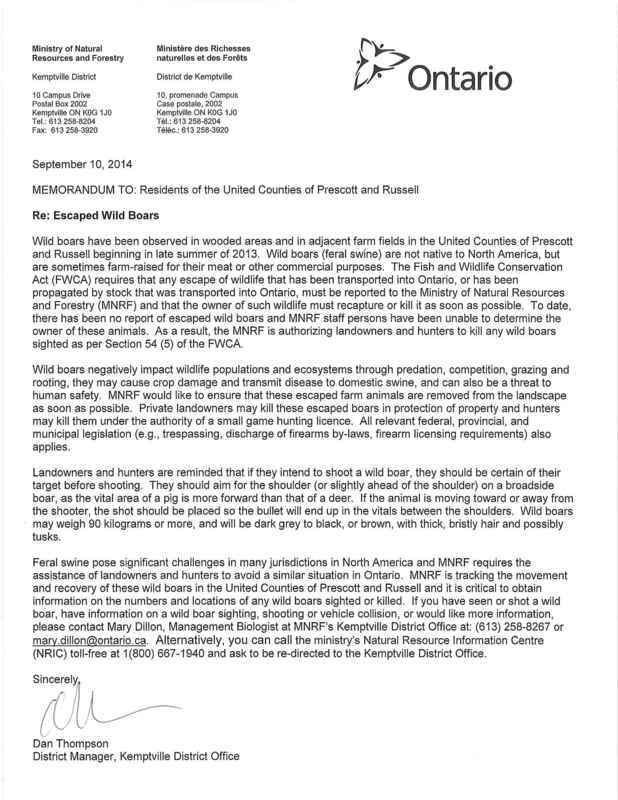 Do your part and report any sightings of feral pigs, or any other invasive species for that matter, to the MNR.